I have had fun sharing all these traditional and non-traditional Mexican dishes with you this week. I have one more great recipe coming at you tomorrow but today I am sharing an informative article I wrote for meal planning/recipe site Food on the Table, all about popular ingredients found in Mexican cuisine. Many of these ingredients are found in the recipes I shared this week and if you don’t make Mexican food on a regular basis, (then there is something wrong with you…. I kid. I kid! ), you may not be familiar with some of these ingredients. And even if you are familiar with these foods maybe there is a fun food fact below that you don’t know or at the very least there is a great group of Mexican food recipes you should most defiantly check out at the bottom of the article! Cinco de Mayo is fast approaching and allows many to celebrate the history of Mexico, honor Mexican culture and of course indulge in Mexican cuisine! Mexico has a rich and flavorful food history, which uses native ingredients mixed with worldwide culinary inspiration to form the popular dishes we all know and love. 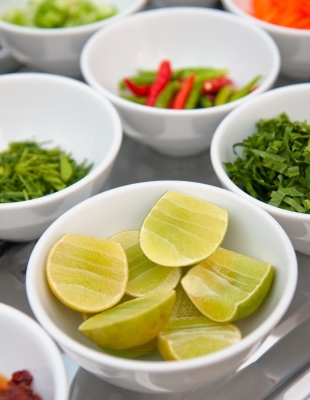 Authentic Mexican cooking starts with traditional ingredients that are found in various regions of Mexico. Below is helpful information about these popular ingredients that give Mexican cuisine its unique flavor. • Tomatillos, a member of the gooseberry family, are small, round green fruits enclosed in a papery husk. They have a tart flavor and are often roasted and pureed into Mexican sauces or salsas, referred to as verde. • Hominy is dried maize kernels that have been soaked in lye to soften the tough outer hulls. Hominy is often ground to make grits or masa flour or added whole to stews and casseroles. • Cilantro is a green herb that comes from the leaves and stems of the coriander plant. It has a strong flavor that compliments spicy dishes. Cilantro is most common in Mexican cuisine, but can also be found in Asian and Indian cooking. • Chayotes are native to Mexico and are a member of the squash family. They are mild in flavor and look like a wrinkled, pale green pear. Chayotes can be boiled or baked or eaten raw in salads. Zucchini or another summer squash makes for a great substitute. • Chile is a generic word referring to a large variety of capsicum peppers. There are over 100 varieties of chiles, including the most popular varieties such as the spicy jalapeno, fiery habanero and large poblano. As a general rule, the smaller the chile the more concentrated the heat; which is from the capsaicin found in the chile’s veins and seeds. Chiles are available fresh, dried, and pickled, and are found in many Mexican dishes. I just bought tilapia fillets and was going to make tilapia tacos tomorrow. yuM! Thanks for linking to my blog for the tres leches cupcakes. fyi- I tried clicking on the strawberry quesadilla and it directed me to Peabody's recipe index.